This has been an unprecedented year of disasters. There have been three federally declared disasters since last winter's snow melted. With families displaced, homes destroyed, power outages, roads washed out it has been challenging to try to even begin the long road to recovery. And each disaster has added a cumulative impact to the recovery efforts, in many cases setting them back to the beginning. It is also clear that the recovery would not be nearly as far along if it were not for our churches and pastors and their willingness to join (and often spearhead) recovery efforts. This has taken its toll on pastors and lay leaders who have responded to the needs of their communities. Many of them have not only been attentive to the needs of their communities, but they have also to deal with the impact on their own homes and families. We gathered the clergy again this month for a lunch. It was an opportunity for respite from the work and a chance for mutual support and resourcing. We shared stories, needs, frustrations and celebrations. In the hopes of offering some much needed respite and renewal we will be working with our National UCC to offer a retreat to the clergy and to the lay leadership of our impacted churches. We've been following the work and progress of our pastors, churches and community. We've also kept in contact with FEMA to get updates. Up to this point our churches have been able to utilize available local funding for these efforts. In the last few months Long Term Recovery Groups (LTRG) have formed and have been conducting casework with clients to determine the resources they need to recover. While many folks have the means and resources to restore their homes and lives, it is typical that the most vulnerable have the hardest time recovering from disaster. The casework completed by the LTRGs has given them a better picture of those likely unmet needs. We distributed grant forms to all four of the LTRG's. 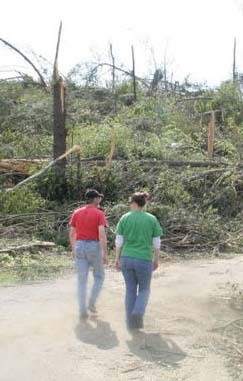 With thanks to our churches who have contributed to our MACUCC Disaster Relief Fund, we will be able to add to the resources our churches and communities need to help the people in greatest need. As the story continues to unfold we will keep you updated on the progress. And as the Advent season unfolds, we invite you to continue to hold the pastors, churches and survivors in your prayers.